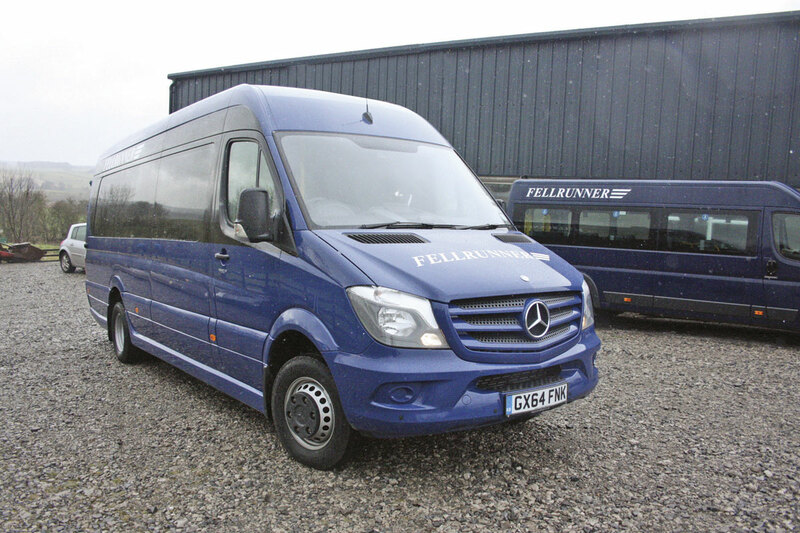 The first production EVM Community built for Fellrunner Village Bus Ltd.
EVM caused a bit of a stir when they announced that they were developing a directly wheelchair accessible low floor Sprinter to add to their range. 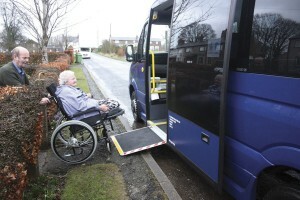 It represented a whole new market sector for EVM who have hitherto confined their activities to the minicoach market, particularly the more luxurious sector, although it must be pointed out that they have produced more conventional high floor wheelchair accessible vehicles for continental customers. Typically, before embarking on the venture EVM carried out extensive research into what was required of such a vehicle. They have built quite a number of conventional vehicles for car rental companies and other providers of corporate and high end transport that service airports, especially Heathrow, and their interest was a key factor in the decision to go-ahead. However, their research also took them into new territories such as health operations and community transport. These investigations highlighted a number of key factors. Primary amongst these was the use of the Mercedes-Benz Sprinter as a basis. This stemmed from the recognition of the superior performance characteristics of the latest Sprinters but perhaps more importantly the ready availability of parts. The use as far as possible of standard Mercedes-Benz components has always been a philosophy of EVM. Another key requirement was the use of rear wheel drive, as opposed to the front wheel drive solutions used by some other manufacturers, but that was coupled with the need to achieve the low floor in such a way that the propeller shaft was protected from damage by sleeping policemen and other traffic calming devices. Finally, the pricing had to be realistic. Many responders felt that the high cost of low floor vehicles was a major deterrent to their wider usage, especially in these cash strapped times. 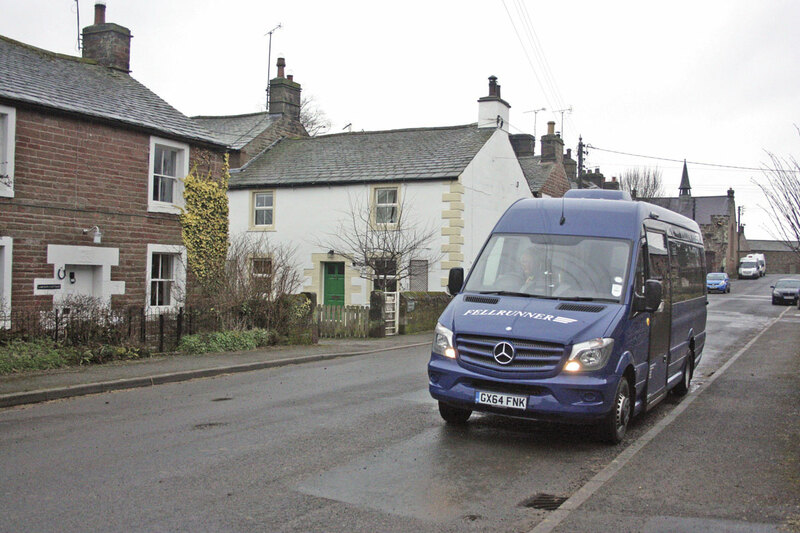 From that research EVM went on to develop the Community which uses a standard five-tonne GVW long wheelbase Sprinter 516 van as its starting point. EVM cut the floor between the back of the cab and the rear axle away and replace it with a sunken floor pan. This component, which is Mercedes-Benz approved, was developed in the Netherlands in conjunction with EVM. This gives the vehicle a ground to entrance step height (without using the ramp) of just 27cm and a minimum ground clearance in the low floor area of 20cm. 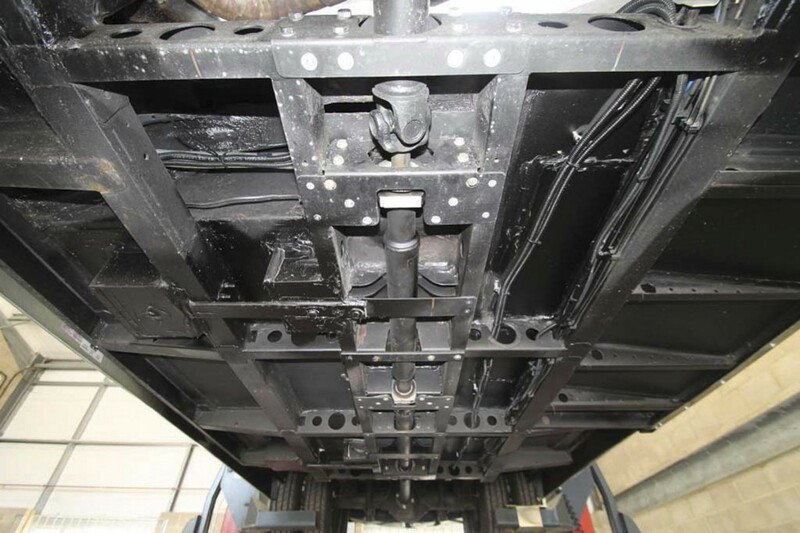 In order to transfer the engine power to the rear axle the drive from the transmission is taken down via a transfer box to allow a straight propeller shaft to be used. Again the transfer box arrangement uses standard Mercedes-Benz components. This is what usually proves to be the Achilles heel of low floor designs because it makes the propeller shaft very vulnerable to damage. EVM got around that problem by cleverly passing the prop shaft through the honeycomb construction of the floor. This results in the drive shaft taking a direct route straight from the drop box to the rear axle. As a consequence, the Community achieves the exact same ground clearance as a standard EVM Sprinter. The other problem is how you deal with the exhaust which again is usually vulnerable to damage. Here again EVM worked with Mercedes-Benz and the Community has an exhaust arrangement where the exhaust discharges behind the B pillar and ahead of the low floor section. This has been achieved by re-positioning the catalytic converter transversely. At the 2013 Coach and Bus Live exhibition EVM showed the prototype Community but that was to some extent a sheep in wolf’s clothing because it lacked some of the key componentry notably the propshaft and the exhaust arrangements. Resolving those issues took some considerable time and it was not until well into 2014 before the vehicle was completed. Readers may remember that I previewed that vehicle in B&CB issue 1290 (22 August 2014). It was not built to the standard layout for these vehicles. Instead of the conventional rear facing wheelchair bay, it was equipped to allow the wheelchair to be carried in a forward facing position. EVM had decided deliberately to build this more complex version which requires wheelchair tie down clamps and more complex passenger restraint systems. I quizzed EVM’s Peter Flynn about this decision at the time and he said, ‘We accept that we probably won’t build many vehicles with that layout but we thought it right to engineer the more difficult version from the start and thus not have to do retrospective design work at a later stage. Now EVM have put the Community into full production and I have had the opportunity to put the first one built with a rear facing wheelchair bay through its paces. 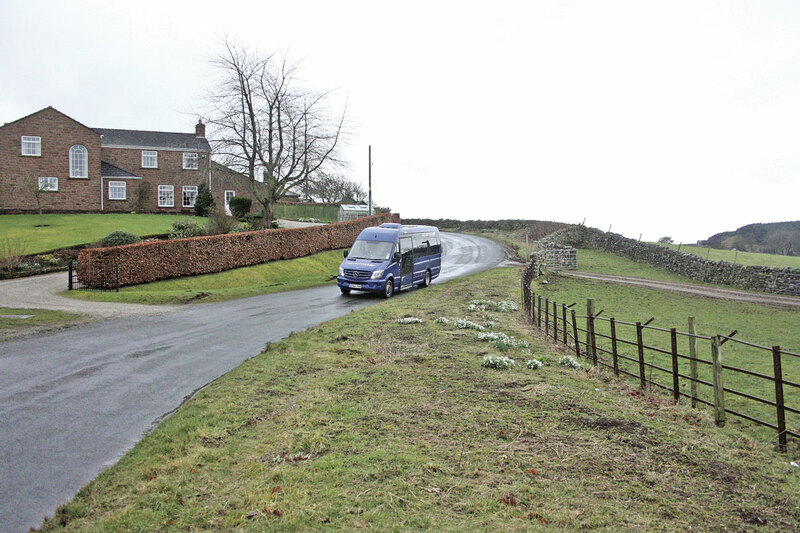 Significantly, the vehicle was built for one of those new to EVM market sectors because it has entered service with Fellrunner Village Bus Ltd at Langwathby in Cumbria. Fellrunner Village Bus Ltd is an unusual community transport operation in that throughout its more than 30 year existence has always been entirely managed and operated by volunteers. It is also unusual in that it has always operated only registered stage carriage services under Section 22 permits; it does not operate any Section 19 permits. Neither have any of its services received local authority subsidies although they have received assistance in vehicle purchase. They have always adopted a policy of not competing with conventional operators choosing to operate as a niche provider delivering services that conventional operators cannot provide. 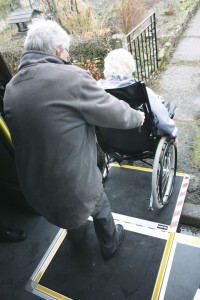 Fellrunner is not new to operating low floor directly wheelchair accessible vehicles although its experience has been very chequered. Their first adventure was many years ago when they bought a Perkins engine Omni. Sadly no sooner had Fellrunner taken delivery of the vehicle than Omni went into Administration. That presented Fellrunner with considerable difficulties in keeping the vehicle on the road because of the difficulty of sourcing parts, but they did manage to soldier on with it for many years. Despite these difficulties it was a very popular vehicle with passengers because of its easy entrance and large windows. Drivers also loved the raised driving position and the excellent vision – very useful when you are operating in area full of narrow, winding, steeply graded roads lined with substantial hedges or very solid stone walls, which is the typical territory encountered on all of Fellrunner’s routes. Convinced that the concept was the right one for them they next bought an Optare Alero, in fact one of the very first examples. Again it was a vehicle that was loved by the passengers and the drivers but it was a nightmare to operate and it nearly brought Fellrunner to its knees. Persistent problems with vibration, water leaks and temperamental air conditioning meant the vehicle spent more time off the road than on it. This meant that Fellrunner was forced to keep operating the vehicle it was meant to replace (a Mellor Vario) for much longer. Eventually, Optare took the vehicle back and replaced it with a new one fitted with automatic transmission. This proved very successful and Fellrunner would probably have bought another had not Optare decided to pull the project. Next they bought a Rohill Kestrel and this proved to be a very successful vehicle, although again due to the manufacturer going out of business, sourcing parts, particularly rear air bellows which it had a habit of destroying, became difficult. Following this catalogue of problems and because the cost of new low floor derivatives had escalated, Fellrunner decided to step back and began buying conventional high floor minibuses, some fitted with rear underfloor tail lifts. These were sourced through Minibus Options. They also acquired one smaller vehicle sourced from the same supplier, a 14-seat Fiat Ducato with wheelchair lift. The company still maintained its desire to operate directly wheelchair accessible vehicles and came very close to buying a Bluebird Orion a couple of years ago but was unable to raise the required finance. Visiting the Show in 2013 and seeing the EVM Community re-awakened their interest and, following a demonstration of the prototype, they decided to take the plunge and order one which they have now received. The Community uses a standard Sprinter 516 long wheelbase van with a wheelbase of 4.325m, a front overhang of 1.004m and a rear overhang of 2.016m giving an overall length of 7.345m. The overall width is 2.0m and the overall height 2.8m. The engine is the very latest version of the Mercedes-Benz OM651 unit to Euro6 emissions standard. It uses AdBlue to achieve the exhaust emissions standards and an 18-litre AdBlue tank is fitted inside of the bonnet. Mercedes-Benz claim this is sufficient for around 6,000 km. The engine is the 2.2-litre Mercedes-Benz OM 651 four-cylinder diesel rated at 163bhp (120kW) at 3,800 rpm and with max torque of 360Nm between 1,400 and 2,400rpm. As an alternative, EVM can supply the Community on the 519 base with the higher powered V6 engine. The engine is matched to the new Mercedes-Benz seven speed 7G Tronic Plus fully automatic transmission. Apart from the Alero, Fellrunner has not operated a vehicle with automatic transmission, but it liked the fact that the 7G Tronic Plus can be changed manually by pushing the lever to the right to go up the gears or left to go down them. There is no clutch involved. Whilst this does enable you to hold a particular gear, unlike the common misconception that a manual change will give better fuel economy, in the 7G Tronic Plus it does not. Drive is transmitted via an integral drop box to give the desired lowered prop-shaft line through to drive the rear axle. These are all standard Mercedes-Benz engineered features. The front suspension is the familiar MB fully independent system with powered rack and pinion steering whilst the rear uses the conventional long leaf spring system supporting the hypoid bevel driven rear axle with telescopic dampers and anti-roll bar. Although not necessary on this vehicle because of its low entrance step level, air suspension is an option. Lowering the front section necessitates re-positioning the fuel tank at the rear on the nearside. The vehicle is fitted with large, bonded, tinted windows, a glazed roof hatch, and comprehensive lighting including special down-lighting at the entrance. 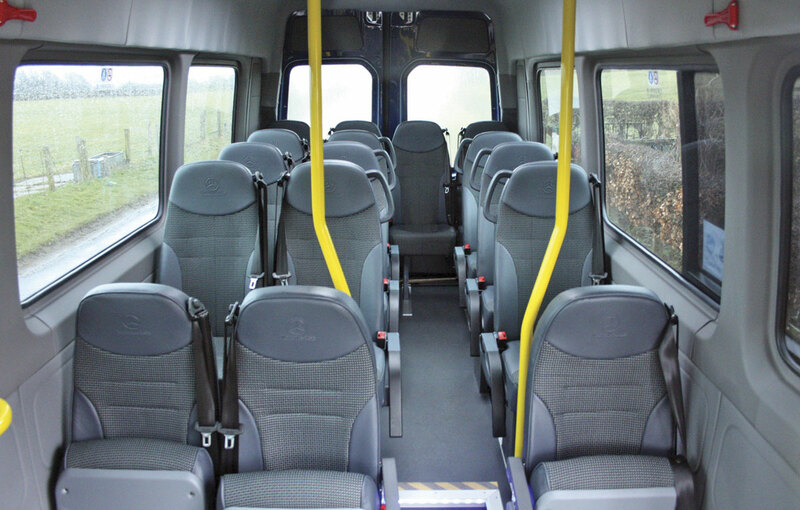 As specified by Fellrunner, it is fitted with 16 Brusa seats. Thirteen of them in the raised rear section are conventional high back seats with belts whilst the remaining three are a single and a double tip up unit in the lowered floor section. Mercedes-Benz air conditioning and Webasto convection heating also feature. 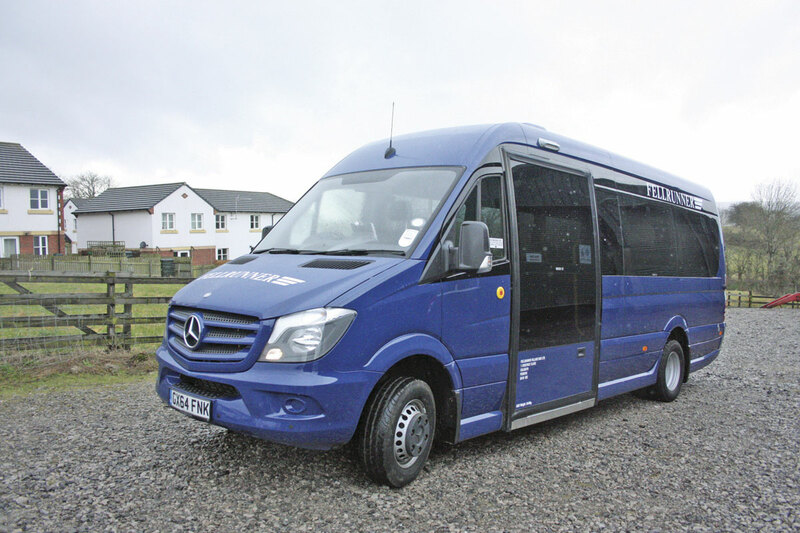 The cab, which is largely standard Mercedes-Benz Sprinter, has a large driver’s storage locker on the nearside and the space where the front passenger seat would be is taken up by a luggage pen. The wheelchair bay has a substantial ironing board back rest, retractable passenger lap restraint and an emergency assistance call button. Of particular interest on the Community is the wide powered entrance door. In their research EVM had found that this was a major area of concern, as EVM’s Danny McGee explained, ‘We talked to a lot of people who use these types of vehicle and found a general feeling that doorways are too narrow and they did not like twin doors that open outwards. They told us that these often get damaged because of hitting street furniture at stops so we sought to avoid that problem.’ They found the solution in a standard door developed by Ventura primarily for the British bus industry and widely in service. The door is a 120cm wide, thin, sliding unit, which opens rearwards. When open it projects only 9.5cm from the body side. Other virtues of the door are that it is quick acting, silent in operation and shuts and locks positively to leave a flush body side. 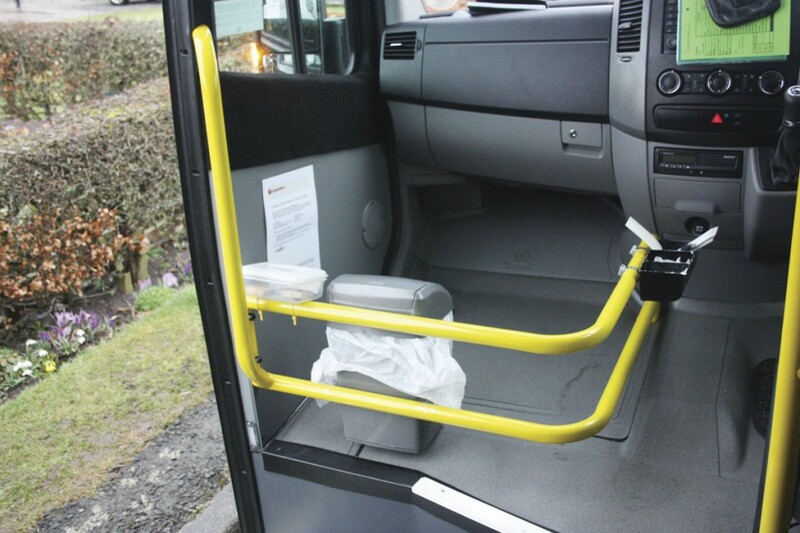 It also has the great advantage that all the operating mechanism is housed within the minibus, over the door. 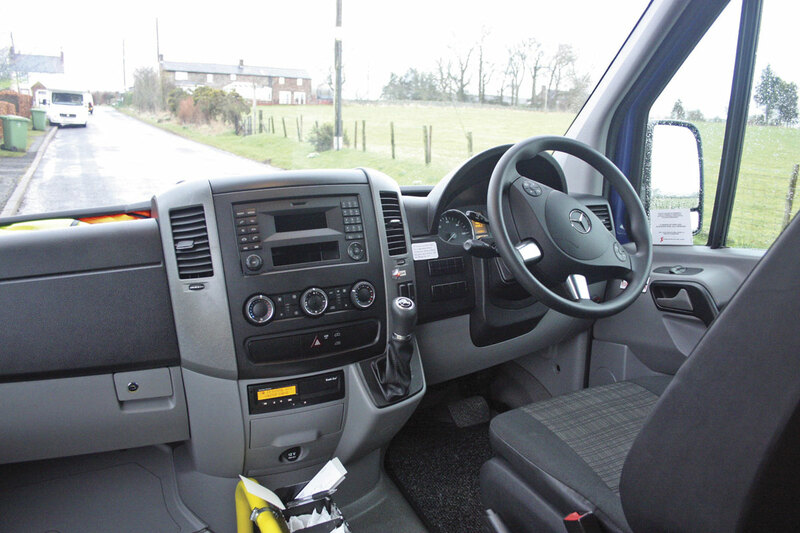 The Sprinter comes with a host of safety features and electronic systems as standard. The Community also benefits from EVM’s five year chassis warranty which provides a full five year’s unlimited mileage warranty on the Mercedes-Benz Sprinter. Fellrunner’s operating territory is tough with very undulating, winding, narrow roads which call for the vehicle to constantly change gear. How would the 7G Tronic Plus take to this I wondered? I need not have been concerned because it took them all in its stride and continued at all times to change smoothly and quietly. In fact quiet was a key feature. It was incredibly quiet inside, even when it was pulling hard up one of the steep grades. Handling, as ever with the latest Sprinters, was superb and so was the ride. No float, no sway, no bounce and a complete absence of rattles and squeaks. My passengers, members of the Fellrunner team, confirmed that the ride even right at the back was excellent. As I have found with other Sprinter 516’s fitted with the Euro6 engine and 7G Tronic Plus transmission it was always on top of the job and just went about its business calmly and efficiently. I was particularly interested in whether there was any vibration from the transfer box system, something such arrangements can suffer from. In the lower gears when tackling a steep rise especially if you put the power on there was just a hint, but it was momentary. For 99.99% of the time, it was absent and very acceptable. On our way we called at the home of Kathleen Hind and her husband Albert in Kirkoswald. Kathleen has never been able to use Fellrunner since she became wheelchair bound. Technically she could have done because Fellrunner does offer that facility if booked in advance but Kathleen has always shied away from that because she, ‘didn’t want to bother them having to move seats about for me.’ This is typical of the high regard Fellrunner passengers have for the services which are often the only ones available to them. 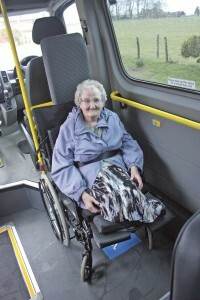 For my part what impressed me about the exercise was not only the well planned wheelchair area but the performance of the Ventura door, quick, smooth, silent and quiet and I liked the reassuring sound it made when you closed it and it locked shut. Although Fellrunner have only had the vehicle a week, word has got around and they are already receiving enquiries from wheelchair users who would like to use the service. As Bill Mitchell, Company Secretary and long time member of the Fellrunner team said, ‘These are new passengers for us and I fear demand may outstrip supply, but it is a nice dilemma to face.’ Already the team are looking at how to raise the necessary finance to buy another one. For my part I was very impressed with the EVM Community. It is well designed, well manufactured and completely on top of the job.